Sealaska Heritage Institute (SHI) will unveil a new exhibit this Friday featuring traditional Northwest Coast armor and weaponry. 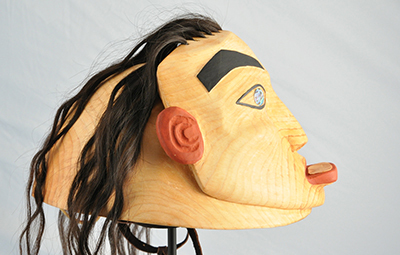 The exhibit includes several pieces and is an accurate representation of how a Tlingit warrior would have appeared to an enemy, said SHI President Rosita Worl. “The Tlingit wore large wooden war helmets that made them appear taller than they actually were, and the helmets often depicted fearsome faces. Our people did not seek out war, but when pushed into battle they were formidable,” Worl said. The exhibit includes war helmets, war collars, slat chest armor, a copper dagger and an iron spear. The pieces range in age from the 1800s to pieces made by artists in contemporary times. The exhibit will be open to the public free of charge from 4:30-7 pm on Sept. 7 during First Friday at Sealaska Heritage in downtown Juneau. Caption: “Woman Warrior” helmet by Tommy Joseph from SHI’s ethnographic collection. For high resolution images, contact kathy.dye@sealaska.com.